Del Real Gourmet Pork Tamales in Red Sauce are prepared with the fines pork slow simmered to perfection then combined with authentic red sauce. 15 Large Tamales (6 oz each) ready to eat. Pork Tamales - Tamal, Tamale or Tamales are made with corn tortilla dough filled with pork, wrapped up in a corn husk and steamed. The word tamal or tamale comes from the Aztec "Nahuatl language" meaning "tamalli" which means bread or corn cake, a steamed cooked corn dough or masa with any kind of filling like pork in red chile sauce. 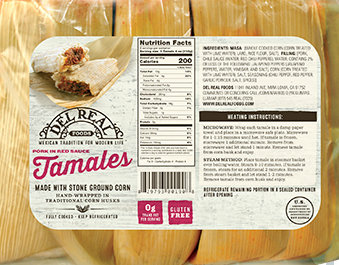 Del Real Foods Pork Tamales are sent in a special packaging that keeps them refrigerated during transit to your destination, so you can enjoy them right out of the box, refrigerate, or freeze for later consumption. We only ship Del Real Pork Tamales from Monday thru Wednesday so they don't travel during weekends. Microwave: Wrap each tamale in a damp paper towel and place in a microwave safe plate. Microwave for 1-2 minutes until hot. If tamale is frozen, microwave 1 additional minutes. Remove from microwave and let stand for 1 minute to slightly cool. Remove tamale from corn husk and enjoy. Microwave ovens vary in rates of heating, times given are approximate. Steam Method: Place tamale in steamer basket over boiling water. Steam 8-10 minutes. If tamale is frozen steam for an additional 2 minutes. Remove from steam and let stand 1-2- minutes. Remove tamale from corn husk and enjoy. Tamales de Puerco en Salsa Roja marca Del Real Foods - 15 Tamales Grandes. Comida Preparada Mexicana - Tamales de puerco listos para calentar y comer. Se envian refrigerados y se pueden congelar o refrigerar y comer poco a poco. Tamales Mexicanos marca Del Real. The meat was tasty but found the masa dry and crumbly. I have ordered these on several occasions and have always been pleased. They are easy to fix for a quick lunch and very filling. They arrive frozen from across the country. Of all the tamales offered, these are the best. This is where I get my tamale fix. I'm from NJ, but originally from San Diego, CA. So happy I found you. Friends and family have been loving these tamales for two years now best you can get online! ConsThere was no hot sauce it was suppose to be included.. The tamales were very good, and the shipping time was quick. Will order again. We have been trying to find tamales in Vermont for many years but no such luck. We know that it is difficult to replicate the homemade tamales that my grandmother make but these had a nice flavor. These are the best tamales I have ever had. These are real tamales like I had when I was a kid in California. Not those little dinky ones that you find most places. Our whole family loves these tamales. They are delicious and so quick to prepare! The price is fair. We live in Georgia now and can not find tamales anywhere. I ordered these and they are so good and close to homemade. Love them! Will be ordering more. Love the red chile pork tamales. hust like the ones my family would make every Christmas in SoCal. Now, that I live in the midwest it's a nice treat. I grew up eating pork tamales and these are as good as any I have ever had homemade. I have bought these from MexGrocer a couple of times and will again. Not too spicy so I can add at the level I can tolerate. These tamales are REALLY good. They arrived cold, as promised; the pork/red chile filling was tasty, but we like our chile hot so we added a red chile sauce on top. Not too much masa, which can ruin a tamale. These tamales look, smell and taste like the ones my Mom made when I was little. We will be buying more of these. I've already shared this information with a coworker so she can order some. 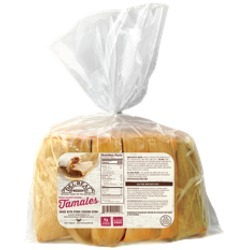 These are the best tamales my wife and I have ever had.The flavor and size is great and they don't skimp on the filling.They are a bit pricy for us but if you wait for a special with free shipping than they are affordable.Excellant product !!! These were very tasty. They are great to keep on hand because they store very well. They are large and worth the money. My homemade are better, but the convenience of these makes them worthwhile. ProsMeat was spiced well; they keep well in the freezer; they are easy to prepare. These are delicious. Served them for Christmas Dinner. The family loved them. This was the second time I have ordered the tamales and will definitely order them again. Wonderful, will certainly reorder this product! 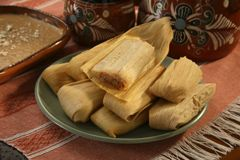 Delicious and authentic Mexican style large tamales, great to entertain friends and family. Cut in half to serve. Muy sabrosos!